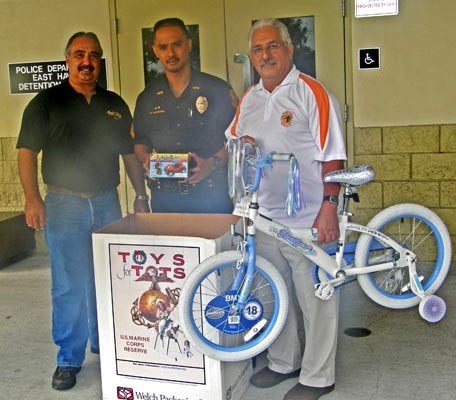 Elsworth Fontes of the Rock & Roll Motorcycle Club, left, poses with Sergeant Regino Saludares and Officer John Stewart (holding bike) at the South Hilo police station, one of eight Police Department donation points for Toys for Tots. All the police stations on the island of Hawai’i will double as drop-off points for Toys for Tots this holiday season. 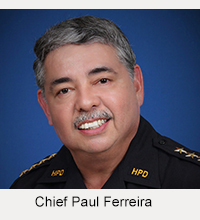 As part of the toy drive, members of the the Hawai’i Police Department and the State of Hawai’i Organization of Police Officers (SHOPO) will contribute funds for the purchase of bicycles for Toys for Tots. 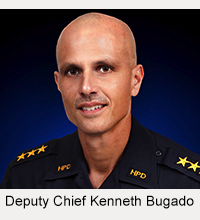 The goal is to provide a bicycle to one child from each police district. Toys for Tots was started in 1947 by the U.S. Marine Corps Reserve. On the Big Island, it is sponsored by the Rock & Roll Motorcycle Club, which is holding its 14th Annual Toys for Tots Motorcade on December 13 in Hilo. Members of the public may drop off unwrapped toys for children ages 12 and under at any police station from Monday, November 23, through Friday, December 11. After the Toys for Tots Motorcade, social service agencies will distribute the toys to children in need.